This was the first hotel at Devils lake. The name "Minnewaukan" was an Indian name for Devils Lake. The hotel opened February 22, 1866. The hotel was located near The North shore of Devil's lake and could accommodate 20 guests. In 1873 the hotel was enlarged to 70 bedrooms and renamed the Cliff House. During the hotel's first years the Minnewaukan operated as a year-round boarding house. Before the railroad reached Devils Lake, early visitors had to travel by train to Portage and then by carriage to Baraboo. The visitor then took another three mile carriage ride to the Minnewaukan. Edward N. Marsh was the original owner of the Minnewaukan. He sold the hotel to Samuel Hartley a year and a half after its opening. In 1879 the hotel was sold to William F Vilas (a previous U.S. Senator from Madison). A three story resort hotel located near the North Shore of Devil's Lake built in 1865, (then called Minniwauken). The resort was built by E.N. Marsh who ran the resort for a few years. Samuel Hart took charge of Minniwauken for two years. In the 1870s the resort's name was changed to Cliff House and was owned by Phil Parsons. The hotel changed hands again and Mr. Cowles took charge. The Hotel had wide verandas on each level, a formal dining room, a grocery store, a barber shop, a telegraph office, a ticket and baggage office. For entertainment, the resort had a billard room, a ten pin bowling alley, quoits (spearing rings from a horse), croquet, and archery. The hotel also reted fishing tackle and rowboats. The hotel operated a steamboat called the "Capitola" so guests could travel around the lake. The Hotel had wide verandas on each level, a formal dining room, a grocery store, a barber shop, a telegraph office, a ticket and baggage office. For entertainment, the resort had a billiard room, a ten pin bowling alley, quoits (spearing rings from a horse), croquet, and archery. The hotel also rented fishing tackle and rowboats. The hotel operated a steamboat called the "Capitola" so guests could travel around the lake. Cliff House was managed by Wiliam B. Pearl from 1878 to 1904. A detached thirty room annex building was built in 1884. Together the two buildings could accommodate 400 guests. For their comfort, guests were allowed to carry kerosene heaters to their rooms. In 1878 Cliff House sponsored a horse race and 2,000 people attended. There were lectures, concerts and othe forms of entertainment. At the turn of the century room rates were $2.50 a day or $10 to $14 a week. In 1854 Nobel C. Kirk(1827-1895) and Sarah Kirk (1839-1921) bought several hundred acres of property at the Southeastern corner of Devil's Lake. The Kirk's built the Kirkland Resort. More than a dozen cottages were also built between 1880 and the 1890s. Most of the cottages had three rooms and a screened porch. In 1893 members of the Fish & Von Walds Orchestra had quarters at the hotel. The orchestra played for dances and masquerade balls held at the Kirkland. In the Fall of 1894 the Kirkland started to hold an annual raccoon hunt. An annual railroad picnic, for several thousand railroad employees and their families, was held from 1887 to 1890. The program included a band, a minstrel troupe, gymnastics and boat races. 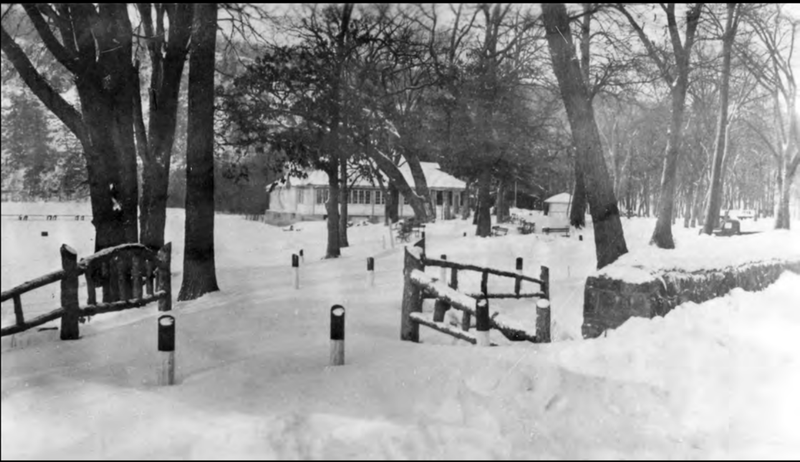 The Kirkland Hotel rented cottages and tents to their guests at Devil's Lake. The Kirkland had a bus that would meet visitors at the railroad station and take them to the hotel in 1909. The Kirks planted an apple orchard and a vineyard. There was a wine cellar for creating grape and currant wine. The resort operated a wine house for guests. During prohibition only soda was served at the wine house. The wine house was removed in 1928-29. A pavilion was used by guests of the Kirkland Hotel The Kirkland Hotel was built in 1906. It was not as fancy as Cliff House but was very popular with families of modest income. Noble Kirk was considered a kind and gentle innkeeper. When Noble died the resort was managed by Harry Otto Terwiller, "High Pockets" for Noble's widow. Terwiller leased the land and ran the hotel until 1921. The hotel was sometimes called the Terwiller Hotel. The Kirland was leased by Arthur Murphy until 1927. Mrs. N.C. Kirk sold the hotel and 430 acres to the state. During the 1930's and 1940's the hotel housed various groups. The Kirkland was torn down in 1946. It was the last remaining Devils Lake resort. The Kirkland cottages were sold to the Silverdale Resort, (North of Devil Lake). The Kirkland Resort Pavilion was detached from the Kirkland Hotel and hosted dances and social activities. 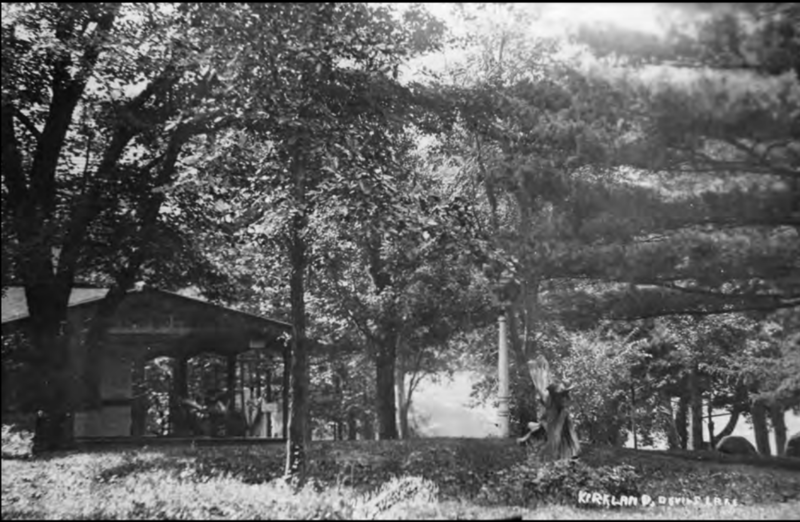 A small fraternal men's organization called Koshawagos, (Men of The Valley) had a club house near the Koshawgos Spring on the South Shore of Devil's Lake. The Public House was a resort that was built in 1870 by H.B. Sheldon. The resort was also called Sheldon House and Fountain House. The resort was purchased by T. Hopkins in 1882 and became the Lake View Hotel in 1890. The first owner of the Lake View Hotel was Edmund T. Hopkins, of Davenport Iowa. Hopkins grew corn and raised livestock, and had an orchard and a vineyard by the Hotel. The Hopkin's residence was called "Hopkin's House". Management of Lake View was taken over by Oscar Messenger in the late 1890s. In the early 1890s the Lake View Hotel was called the Public House. The hotel was enlarged and renovated. In 1892 the name was changed to the Lake View Hotel. The Hotel was on the South shore, (where the present day South Shore Store is located). The Lake View was three stories high. The Hotel rented five cottages for their guests. Each cottage had five rooms. The Lake View and its land were sold to the state which leased the property. 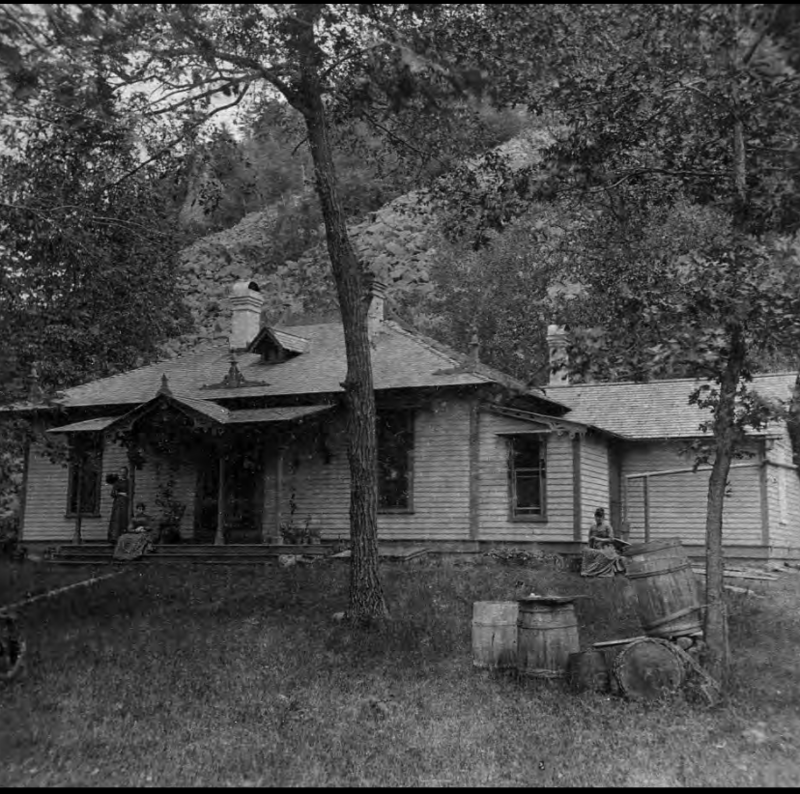 Hopkin's House was used by the Civilian Conservation Corps in the 1930's.The last Lake View Hotel cottage, (Pine Cottage) was used by park employees during the 1940s and 1950s. The Pavilion and Hotel were removed in 1952. 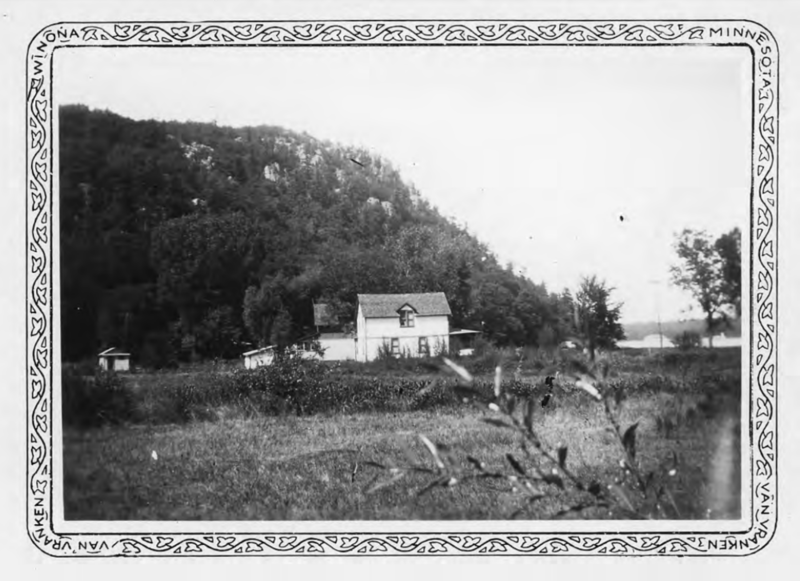 A Hotel on the Western part of the South Shore of Devil's Lake operated by Oscar and Emmi Messenger. The hotel had a pavilion, an annex, two houses for employees, a barn for riding horses, an ice house, and a confection stand. The old South Shore Road terminated at the Messenger Hotel pier. The Hotel closed in 1908 and was removed in 1915. 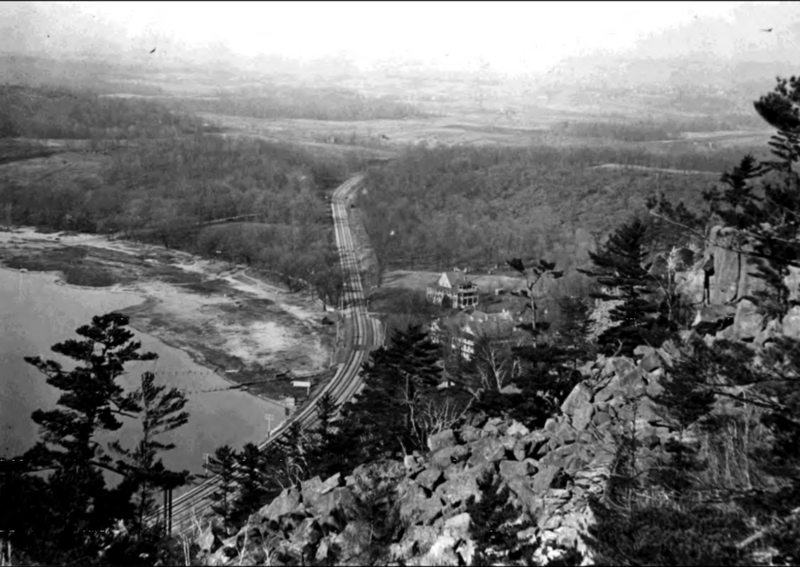 The Panoramic Resort operated outside the North entrance of Devil's Lake State Park from 1929 to 1988. The resort got its name because of the magnificent view of the City Of Baraboo. The resort was built on the location of the former "Loop Dance Hall," owned by Fred Kellogg. The resort was owned and operated by the Roche family. Originally it operated 15 cottages and a two story hotel. At the peak of its operation the resort boasted 40 cottages. The hotel burned down January 4, 1934. In the 1980s the resort was forced to shut down. The resort was unable to hook up with local sewer system. The cost of meeting state septic standards was prohibitive so the Roche family sold the resort and the property to the State Department of Natural Resources for $225,000. Prader's Pavilion was a concession building that predated the Chateau.